Stock trading journal helps to develop discipline as you can analyze trades regularly. You’ll learn more about how to improve your performance from keeping a journal than from any market guru. This written list of trades helps you to trade with more confidence knowing that your system stands up to statistical scrutiny over a period of time. It also allows you to discover good and bad trading habits and how they affect your performance. And definitely you will be able to start trading for a living since you will understand your system better as you review your performance in a more structured and consistent manner. However, keeping records is hard and boring. You can write a daily journal for stocks trades to a spreadsheet. But there are a much better ways to have your own personal trading journal. TradingDiary Pro is standalone application which offers a lot of features important for every trader or investor. 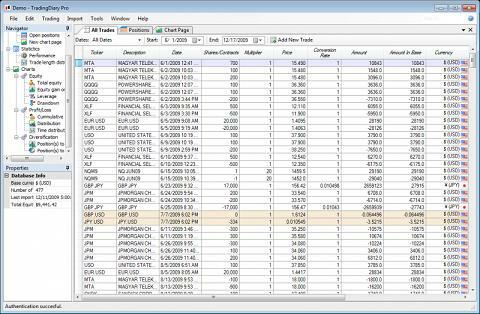 TradingDiary Pro offers an easy way to keep track of your stock trading. Just enter your trades as you make them into this journal and it creates reports so you can evaluate your trades and you can find out what works and doesn’t work with your strategies. So many traders repeat the same few mistakes without ever realizing it. This stock tracking software helps traders to learn from their mistakes so they don’t repeat them, and their trades can become more profitable. TradingDiary Pro journal application also offers an automatic import of your trades from your trade application of your broker. It could save a lot of time if you’re a day trader with a lot of trades every day. I’ve used TradingDiary Pro for a long time, I can really recommend this trade journal app. It had its issues, but Istvan (the creator of this great program) is really friendly and supportive. Last time I suggested some add-on to the service it took only a few days to be added. I recommend to test this best app for keeping stock trade journal as it is a must for profitable trader. Go to TradingDiary Pro web site and start your evaluation as soon as possible. If you want to join the group of these profitable stock traders, then using some stock tracking software for trading journal like Trading Diary Pro is mandatory.